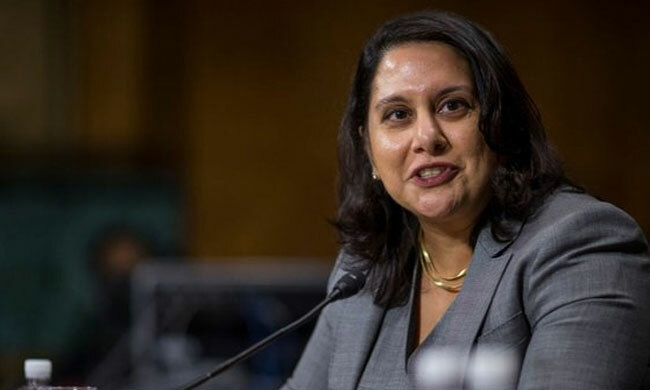 Neomi Jehangir Rao, an Indian American Lawyer, has been appointed as United States Court of Appeals for the District of Columbia Circuit. She was nominated by the Senate to the post previously occupied by the current US Supreme Court Judge Justice Brett Kavanaugh. Her nomination was confirmed on March 13th by the Senate by Yea-Nay Vote. 53 - 46. She was sworn in by US Supreme Court Justice Clarence Thomas in the Roosevelt Room of the White House. The President Donald Trump attended the swearing in ceremony. Earlier, Rao served as the Administrator of the Office of Information and Regulatory Affairs (OIRA) of the Office of Management and Budge. She was born in Detroit to Parsi physicians from India — Zerin Rao and Jehangir Narioshang. She is married to Alan Lefkowitz and they have two children. She graduated from Yale University and the University of Chicago Law School. She also worked as a professor of structural constitutional law, administrative law, and legislation and statutory interpretation at the Antonin Scalia Law School at George Mason University. On March 13, the US Senate considered the nomination of Rao. Senator Mcconnell,welcoming the nomination, spoke: "This nominee is yet another of the President's excellent choices to serve as a Federal judge. Ms. Rao graduated with honors from Yale and the University of Chicago School of Law. Her record includes a distinguished tenure in academia, public and private sector legal experience, as well as a clerkship on the U.S. Supreme Court. Most importantly, in testimony before our colleagues on the Judiciary Committee, she demonstrated a commitment to maintaining the public trust and upholding the rule of law. So the committee favorably reported Ms. Rao's nomination, and soon the Senate will have an opportunity to continue fulfilling our advice and consent responsibilities by voting to confirm her to the Federal bench." On the other hand, Senator Markey, said that these ultra-conservative judicial nominees will rubberstamp Donald Trump's far-right agenda. He also said: "Ms. Rao utterly lacks the experience to serve on the court that many view as second in importance only to the U.S. Supreme Court. She practiced for only 3 years as an associate at a large law firm. None of her practice was in Federal courts or State courts, before administrative agencies, or involved criminal proceedings." The senator also criticized her on various aspects and urged the senate to vote against nomination. He said: "We don't need a judge on the DC Circuit whose record demonstrates that she is a sympathetic ally to their anti-environment agenda." Topics : Neomi Rao | United States Court of Appeals for the District of Columbia Circuit.